Find out about glass painting with enamels and learn lots of different ways to apply them. Enamels (often called paints) used for stained glass painting are made from ground glass mixed with different coloured pigments and a flux. They are applied in a variety of ways before being fired on permanently in a kiln at temperatures between 968F/520C and 1382F/750C. Enamels used for stained glass painting can be either opaque or transparent, and can be mixed together, as long as you keep to the same manufacturer. The good news is that this enables you to create a huge range of exciting colours. You will need to keep accurate records of the mixes and the firing temperatures of your painting colour tests, otherwise all your experimenting will be wasted. High or low firing paints? The different firing temperatures of the paints tell you whether you are using low or high firing stained glass paint. High firing paints are better for fusing, as they can withstand the hot temperatures needed for the fusing process. The low firing paint is more suited to stained glass work that can then be incorporated into leaded or copper foiled panels. As usual, health and safety has to be thought about. The dreaded skull and crossbones icon tells us that stained glass painting is dangerous, so a mask and gloves is recommended. It’s not advisable to eat when painting. – If you apply transparent paint onto sandblasted, etched or abraded sheet glass you will end up with a semi opaque effect (see photo below). This method gives a far deeper depth of colour. It’s also good if there’s a nasty view that you want to obscure beyond the window. – You can partially remove stained glass paint that has been fired by sandblasting, etching or abrading. 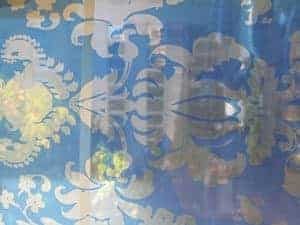 Using this technique will mean that you can create decorative, painted textures on your glasswork. – The best way to achieve a richer colour is to fire several layers of the coloured paint separately, building up the density as you go. There is a detailed explanation of this technique here. If you do the stained glass painting too thickly it will crack in the firing or register as black. – For best results use the enamel on pale or clear sheet glass – the colours are lost if you use a darker colour. – You can apply enamels on to glass that has been engraved first, or engrave into the stained glass painting once its been fired in a kiln. This allows you to create drawn details, and adds life to your painting. – Try experimenting by mixing the glass paint with different mediums other than water. Gum arabic, oil, damar varnish or a commercial screen medium will give you different effects, and will be better for painting different subjects. For example, water is good for subtle shading and damar varnish is good for thick line work. – Opaque paints designed for ceramics – onglazes – can be fired up to 1562F/850C and can be used in conjunction with fusing and slumping. Wear a mask for this, as dry paint is particularly dangerous. The paints can be applied dry before they are fired with a fine sieve. – You can be very free with this by shaking the sieve over areas of the sheet glass. 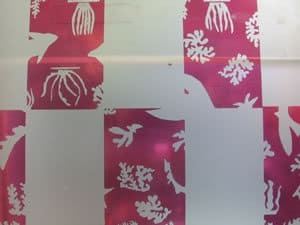 – If you want a more controlled effect, you can make a stencil from thick paper or mask out areas of the glass before sieving over with dry paint. -You can also draw patterns into the dry paint with a stick or other blunt instrument. – Another suggestion is to brushing your glass with glue – this could be in a particular design or randomly – and then sieve the paint over it. Wait for it to dry before shaking the unwanted paint off. With traditional stained glass painting, you can do the painting with brushes, print it on with sponges, screwed up paper, stencils, potato prints – anything that gives you the texture that you’re looking for. With any of these techniques, you need to practice before you can begin to feel confident and consistent with your results. Mix one part paint with two parts of either water, oil or a water-based medium into a creamy consistency with a palette knife. It’s a good idea to do this thoroughly, so that the paint will be smooth once fired. The paint will show brush strokes, so its best to capitalise on this by choosing a soft brush which holds lots of paint, and apply with swift confident strokes. This needs practice! There’s a whole series of tutorials taking you through the whole traditional stained glass painting process, from choosing the right paint to firing the work in a kiln. Milly, is this tutorial/classes for sale? Thanks for the question Mitzi. I don’t have any painting on glass classes at the moment, sorry. 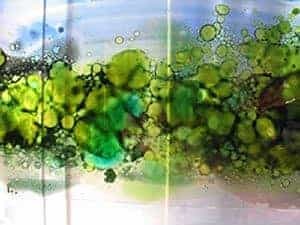 There is a really great website called Real Glass Painting that has online glass painting courses. Hope that points you in the right direction.